South Africa has opened its 2018/19 avocado season, one that will not repeat what has been called the “astronomical increase” (or “an inundation of avocados”) of last year. The new crop will be roughly 30% lower, but, like last season, the figure could perhaps later be adjusted upwards. “We might still be surprised on our current estimate, due to the massive expansion of areas under avocado as well as new regions and growers who are not necessarily linked to SAAGA [South African Avocado Growers’ Association],” says a technical advisor. He notes that different cultivars carry their fruit differently, some inside the leaf canopy, others more towards the outside, which complicates the matter of standardised crop estimates. The giant harvest of last year – edging close to 23 million 4kg equivalent cartons – put strain on packing and storage capacity. In some instances fruit that should’ve been picked earlier, were left hanging either because of packing constraints or in expectation of a price improvement, placing trees under stress. The heat wave during early summer across much of the country, at a critical period when some varieties were setting fruit, has led to incidences of fruit drop, particularly on Hass and Hass types (reportedly not so on the early Maluma Hass). Reductions of up to 40% in some Hass blocks in the Tzaneen area have been mentioned, but it will be buffered by new Hass orchards. Unfortunately for South African avocado farmers where older varieties excel, export demand is waning for greenskinned avocados. Last year was a difficult one for some Pinkerton farmers exporting to Europe, where the Pinkerton market crashed and fruit was dumped. 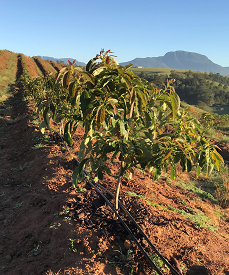 There is one region which wasn’t affected by a heatwave and which has, in fact, had a very temperate summer: the new and quickly growing avocado region in the Southern Cape. There is a lot of optimism among avocado growers in the Cape. They hope not to share in the expected 30% drop of elsewhere in the country, largely due to new plantings and the summer temperatures ranging around optimal avocado growth conditions. Their harvest only starts around September, running until Christmas. However, despite the drought officially being broken, dry conditions remain a concern in this area. The very earliest Hass from Southern Africa, where there is strong avocado expansion across much of the subcontinent, comes from Mozambique where the precocious Hass-type, the Maluma, had already been harvested by mid-February. Currently Maluma Hass is being harvested in Mooketsi, Limpopo. Theft of avocados is a thorn in the side of farmers, especially immature stolen fruit which find their way to municipal markets. Fruit picked before attaining adequate moisture and oil levels will never ripen. The theft appears to be perpetrated in an organised manner, fruit even neatly picked with stems intact. Farmers organise their own patrols at farm-level to curb theft. The macadamia industry is even more affected by the phenomenon.